SF Uke-toberfest is an annual ukulele festival in San Francisco, and it consists of a day full of workshops, a marketplace area, and an evening concert. I was there with my fellow uke-mama Ashlee to host a Musical Mama booth in the marketplace. This was my second-ever festival, and I knew the vibe was going to be different from my first festival. For starters, Uke-toberfest is smaller, held indoors, and takes place in a completely different city with a completely different culture. My day started before dawn, when I woke up to get ready, load up the car, and deal with a few surprises (like my son’s bloody nose!). Once things at home were under control, I drove over to pick up Ashlee, and we made our way up to San Francisco. WHAT. A. FUN. DAY! Most of my time was spent at the MM table, where I got to engage in some really great conversations with some of the workshop leaders, other vendors, and many people attending the event. Can you guess which uke was more popular? 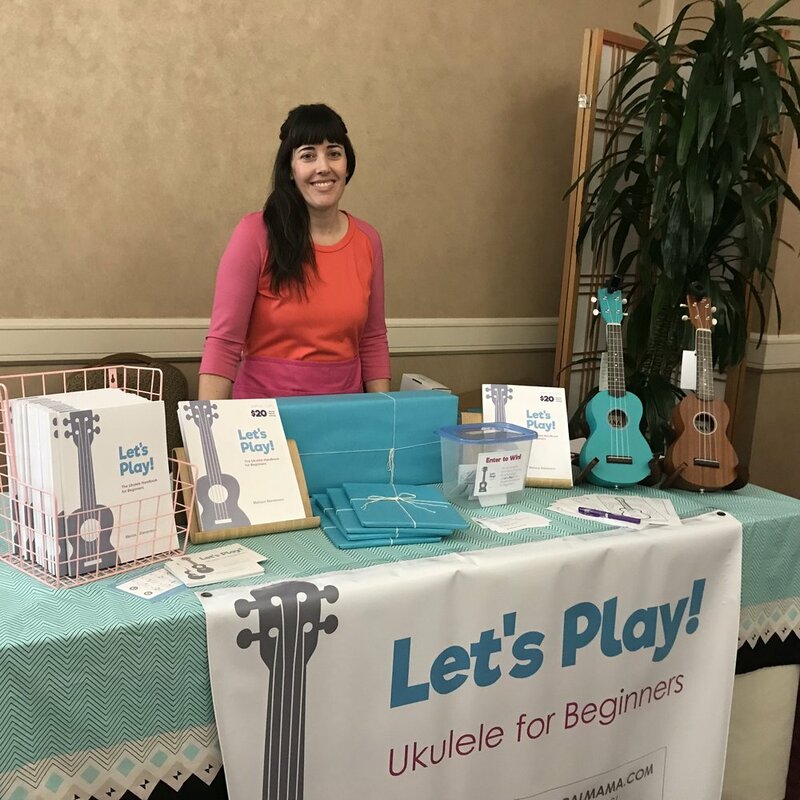 At my booth I had my book, free chord charts, free ukulele coloring pages, and a new offering: ukulele starter kits featuring Ohana ukuleles. Two highlights were the man who bought an ukulele starter kit for his sister (I won’t name names, on the off chance I’d blow the surprise, but seriously— what a sweet brother!) and Roxanne, a woodworker who bought the turquoise ukulele starter kit because she had been looking for a new hobby. Other highlights include getting to chat with Craig Chee, Ukulenny, Patrick and Eric from Kala, and the many, many kind folks who stopped by the Musical Mama booth. I offer a heartfelt thank you to everyone I met with yesterday, and a big hug to all who purchased my book! NB: If you bought my book, please make sure you read the introduction to find the URL for the play-along videos. Are you going to Uke-toberfest? The second annual festival, hosted by SF Uke Jam Leaders Cynthia Lin and Ukulenny, is happening this Saturday 9/27/18 in Japantown in San Francisco. The event consists of a full day of workshops covering a wide range of topics targeted for a variety of skill levels, followed by a concert that evening. I’ll be there with my uke mama friend Ashlee, representing Musical Mama in the marketplace area. The marketplace is free and open to the public, so come check it out! In the video, I chat a bit about what I’ll have available at my booth. I forgot to mention that I’ll also have free chord charts and ukulele colorings pages, too. If you’ll be there, make sure you come by and say hi! UPDATE: Several people asked when I planned to host another workshop in the area, and I hope to have an answer for them soon! I will likely be back in Southern CA in November and am currently looking into whether I can plan another workshop while I’m in town. I will post about upcoming events on the blog, and you can email me if you’d like to join my mailing list. 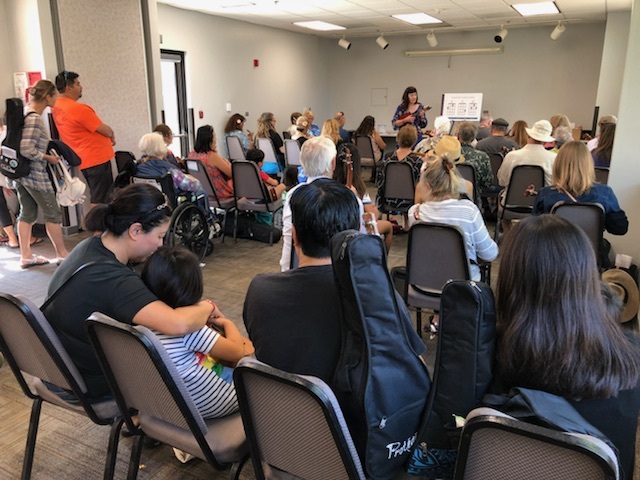 The 2018 Los Angeles International Ukulele Festival took place on Saturday, 9/22 at the Torrance Cultural Arts Center. I drove down from San Jose (leaving my hubby and kids at home) on the Thursday prior, spent some time with my parents in OC on Friday, spent all day at the festival on Saturday, and drove home on Sunday. This event was the first time I’d ever led workshops at a festival and the first time I’d ever operated a vendor booth! I did my best to prepare for both, and I’m so glad I got to be a part of this unique event. my only regret for the workshops was not getting more pictures and videos! I have to say, teaching brand-new players how to play the ukulele is one of my all-time favorite things. It’s just so darn rewarding to show people that, regardless of their musical experience (or lack of it), they really can learn to play the ukulele. In the 45-minute sessions, I taught the groups three chords and five songs that are fun and easy to sing and play. Groups of friends, young couples, grandparents with their grandkids, parents with young children, tween boys… I think almost every age group was represented! Thank you Louis and Ohana Ukuleles for sharing the bongoleles and shakerleles! For the kiddos who were too little to play ukes, I had some rhythm instruments and trinkets I brought out throughout the workshop. Louis from Ohana Ukuleles very generously provided Shakerleles and Bongoleles for the adults and big kids to try out. Aren’t they beautiful? I’m particularly fond of the shakerleles, which are a more sophisticated take on the egg shaker. They feel so good in the hand and make such a satisfying sound when shaken. Making music is so much fun when it’s a shared experience, and group jams are hard to beat. Thank you to all who attended my workshops. Thank you for sharing your time, your energy, and your beautiful voices! If you attended the workshop and want a PDF of my handout, please fill out my contact form and I’ll email it to you. Jane and Katie. Aren’t they cute? My booth was in the marketplace area, which was open to the public. And conveniently enough for me, my booth was located right next to the room where my workshops were held, so most of my time was spent either in the workshop room or in the marketplace area. At my booth, we sold copies of my book and shared free chord charts and ukulele coloring pages. My friends Katie and Jane (both of whom are Musical Mamas!) helped me out all day, and they were AMAZING. I honestly couldn’t have done it without them, and I feel so grateful for their help. I did get a few opportunities to wander around the festival and briefly check out the other workshops and performances, and everywhere I looked I saw people having a good time. This was true for the marketplace area as well. So many smiling faces and lovely conversations with folks of all ages and levels of experience. Getting Ready for the 2018 Los Angeles International Ukulele Festival! This Saturday, September 22, you can find me at the Los Angeles International Ukulele Festival at the Torrance Cultural Arts Center! I’ll be leading three Family Jam workshops and running a booth in the marketplace. This starts a new chapter for me as an ukulele teacher, and I’m excited to be a part of this awesome event. There are going to be so many good workshops and performances throughout the day, featuring Taimane, Aaron and Nicole Keim, Cynthia Lin, Ukulenny, Mitch Chang, and more. My family-friendly workshop is designed for beginners and brand-new players of all ages. In 45-minutes, I’ll teach you how to play and sing five songs that are fun for everyone! Workshops start at 10 am, 12:30 pm, and 3pm in the (air-conditioned!) Garden Room. 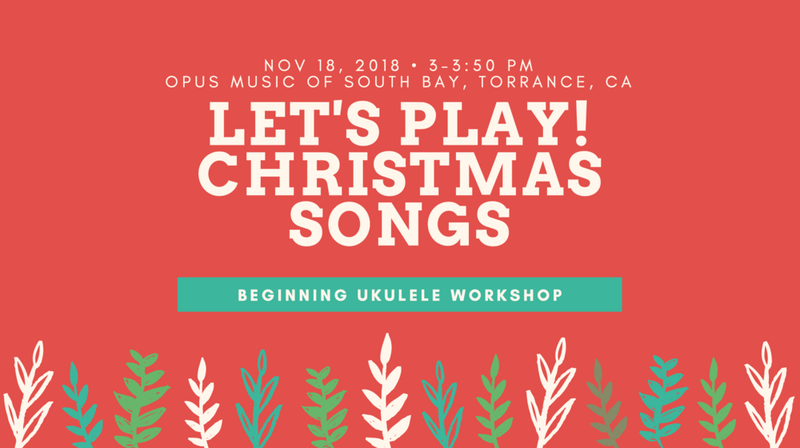 Kala is generously providing loaner ukuleles for anyone who needs one, and I’ll be bringing rhythm instruments for the littlest music-makers who attend. I’ll also be hosting a giveaway at the end of each workshop, meaning there are three chances to win a copy of my new book. At the booth, I’ll be selling my new book, Let’s Play! The Ukulele Handbook for Beginners at a special festival rate of $20 (normally $24), and I’ll also be handing out free chord charts and ukulele coloring pages. Since I’ll be teaching workshops throughout the day, I’ve enlisted the help of my awesome friends (and ukulele players) Katie and Jane to help me run the booth. I’ll be at the booth as much as I can between Family Jams. Ohana Ukuleles, Uke Life, Tyde Music, and Nalu Ukulele are just some of the vendors who will be offering their wares on Saturday. I know that there are going to be so many beautiful instruments on display! I love that this is truly a family-friendly event. Tickets are $45/person and kids 12 and under get in free. See the schedule and learn about the events by visiting the Los Angeles International Ukulele Festival website.